Representing Canterbury is St Albans Cricket Club. The 14-man squad to represent the club is: Ben Langrope (captain), Gregory Dawson, Reid Gibbens, Jack Harper, Matt Holstein, Aaron Johnstone, Tyler Lortan, James O’Gorman, Robbie Polson, Dan Sharples, James Southby, William Southby, James Tapper, Bailen Thatcher and scorer Nicola Blue. The closest match of the opening round by far was a thriller that went the distance on the number two ground between Wellington’s Eastern Suburbs and Christchurch’s St Albans. Sent in, Easts had set St Albans a chase of 217 after the Wellingtonians were all out on the stroke of 50 overs in their innings. Opening pace bowler James Tapper did the bulk of the damage with his 4-27 off 10 overs. The “Saints” had been well set at 139 for two, The opening pair of Dan Sharples (53 off 30) and Greg Dawson (61 off 85) getting them off to a flying start to the chase. But it was two wickets in the space of three deliveries from Wellington Firebird Michael Bracewell that later brought Easts back into the contest. From there, Easts began exerting more pressure to make regular breakthroughs, but it was the Saints day as they managed to get home with 1 wicket and 8 balls to spare. 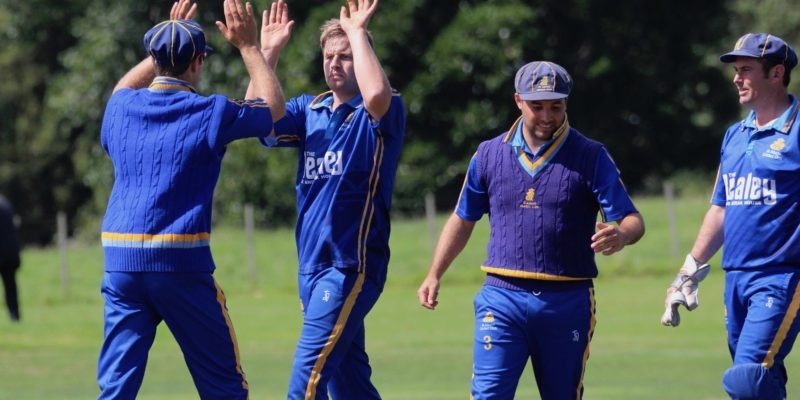 Canterbury’s Saints again won the toss and batted out their full allottment to post 256 for six against the Auckland side. It wasn’t without early struggles. Opening batsman Dan Sharples lost three partners inside the opening 10-over powerplay, Parnell’s slippery Ollie Pringle going on to 3-53 off his 10. Polson top scoring off the bat with 82 runs. Parnell got off to a undesirable start in their reply, losing both opening batsmen with just four runs on the board, Reid Gibbens (3-21) coming into his first match at the tournament and claiming them both in his first three overs. Jack Harper had struck twice, and despite a positive 45 from Parikh who hit back-to-back sixes off Langrope amid 21 off the over, the “Peaches” from Parnell couldn’t get close, bowled out for 146 inside 37 overs. Christchurch’s St Albans made it four from four as they put themselves into the 1v2 Final and dealt a cruel blow to their fellow South Island representatives who needed the win themselves. Green Island opted for a bat on the number two ground, but were soon in strife as they lost their top three inside the first six overs. Bailen Thatcher had accounted for all three at 31 for three, and would go on to a five-wicket bag when he claimed the next two wickets as well, dismissing all the top five batsmen in his impressive 5-50 off eight overs. With Geordie Scott already back in the tent, Croudis had found support from Christi Viljoen whose dependability down the order was on display yet again. They’d shared a 145-run stand for the fifth wicket and Viljoen would remain undefeated, reaching 97 not out off 116 balls (8×4, 3×6) but denied a century by some tight and consistent bowling through the death as Green Island finished up on 269. St Albans made their customary solid start in reply. Dan Sharples again reached a half century, but would fall just five runs shy of what would have been a brisk century opening stand with Greg Dawson. Anchorman Dawson began work on a fresh partnership with Tyler Lortan who arrived in the 14th over and didn’t leave until the job was done was done in the 49th. The successful chase being St Albans highest they’ve had to chase down at the tournament. “Texans” captain Liam Rukuwai had won the toss and elected to bowl on a tacky surface in brilliantly fine conditions, just a half-hour delay necessary for dew to burn off the outfield after the previous day’s heavy rain. The match began ominously for Rukuwai, however, as the captain conceded 17 runs off the first over of the match as Dan Sharples raced out of the blocks for St Albans. It was St Albans’ fourth appearance in the Final, and they had got there undefeated as the only club to have beaten Napier Tech in the round robin. Yet they were destined to be bridesmaids yet again, as the trophy eluded them for a fourth time. St Albans was bowled out in the 35th over, the opening breakthrough by NTOB paceman Stevie Smidt triggering a domino effect through the St Albans innings. But it was the spinners who profited with Meehan’s 5-16 backed up by 2-13 off six overs from New Zealand Under 19 rep Todd Watson, who was later named Player of the Tournament. Napier Tech’s chase was not without its own wobbles, but Meehan and Watson chased down their target in 34.1 overs to claim the national club title for the third time (previous national crowns won in 2003 and 2018).